Deadline for submitting your projects is Wednesday, January 22 at 11:59 PM US Central time. 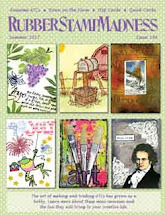 Hello everyone, Lynda here and my challenge for you this week is to use your stamps to create a scene. 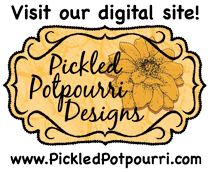 I love using stamps to tell a story on my card and I think you'll agree that the design team has done an outstanding job showcasing for you the variety of scenes you can create with images found in the Red Rubber Designs store. For complete Inspirational rules please read them here. For my project I combined images from the Old Truck stamp set and the Mountain Scenery set to create my scene. 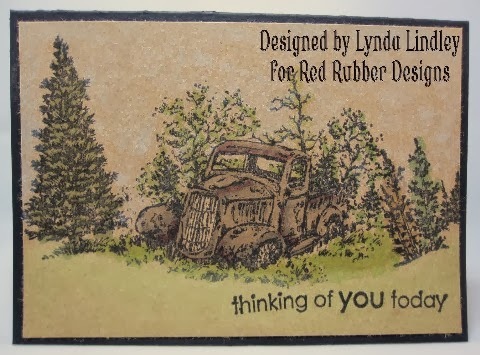 I first stamped the old truck and then masked off the image as I added the mountain scenery stamps to both sides. I colored my images using my Copic markers and chalk. 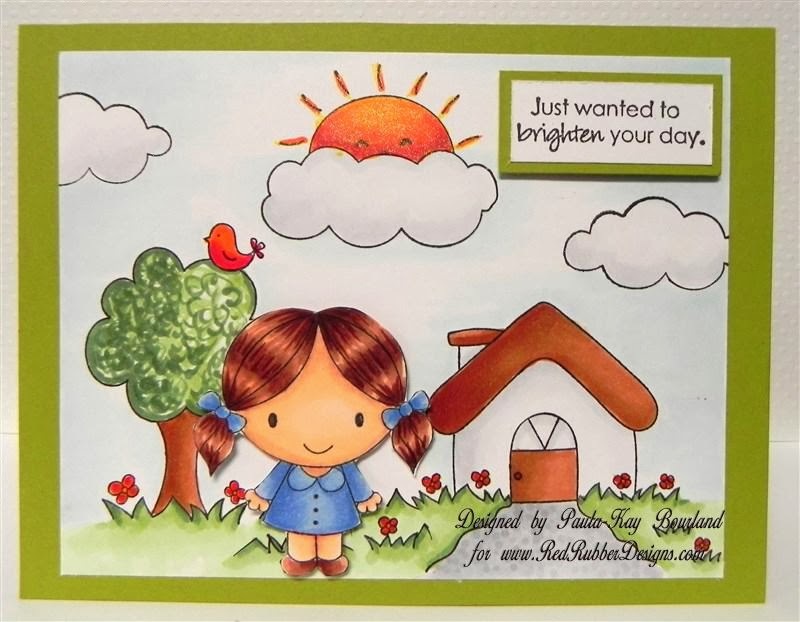 Paula-Kay created this darling scene using the images you can find in the Brighten Your Day stamp set. This cheerful greeting would be sure to bring a smile to the face of whomever should find it in their mailbox. and finally Kendra, created this adorable Penguin scene using the Cuddly Penguin stamp, Ornamental Snowflakes for the background and the Label Lingo Frames and coordinating Occasions stamp sets. Isn't he the cutest thing and this wintery scene is just perfect to showcase his sweet face all bundled up. Lovely cards ladies! Another great challenge!! Everyone did such beautiful backgrounds!! Very inspiring! Beautiful cards! I added one called Majestic Mountain. I need to get more involved!